For 17 straight years the LBI Spring Surf Fishing Tournament has offered a great competitive way for anglers to enjoy surf fishing the beaches of Long Beach Island. With the awesome spring bluefish and striped bass fishing it offeres some of the year's best action. 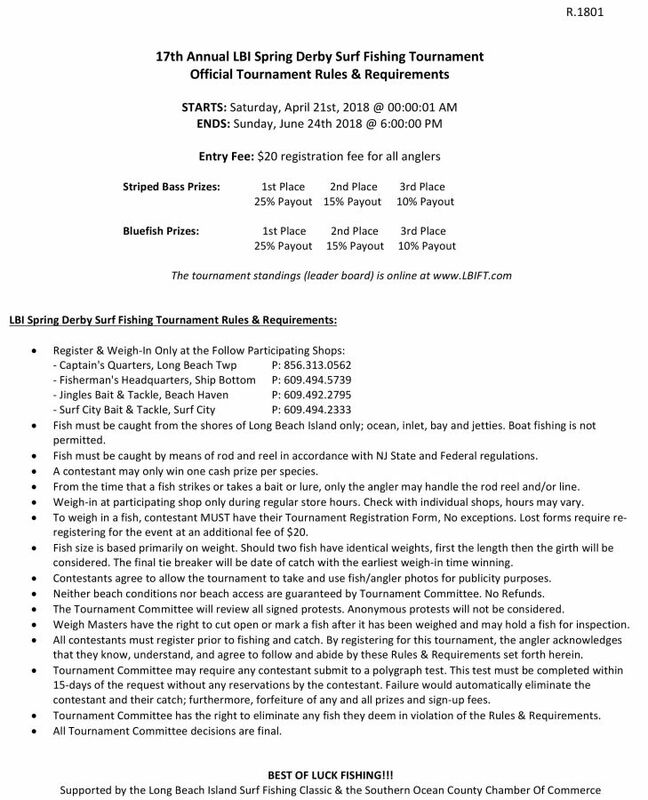 The 2019 Long Beach Island Spring Surf Fishing Derby is a 9 week striped bass and bluefish surf fishing tournament. Sticking to the roots, it's a fun surf fishing tournament with a simple format. Most importantly it's a low kill tournament format that awards the top fish/anglers by weight. No daily, weekly or segment prizes . If your fish can not beat the three top leaders, please release your fish to swim another day or responsibly harvest for a delicious dinner. Registration is $20 for all anglers. The three largest striped bass and the single largest bluefish win cash. Based on 100 registered anglers: First Place Bass (40% Payout), Second Place Bass (25% Payout), Third Place Bass (20% Payout) and First Place Bluefish (15% Payout).